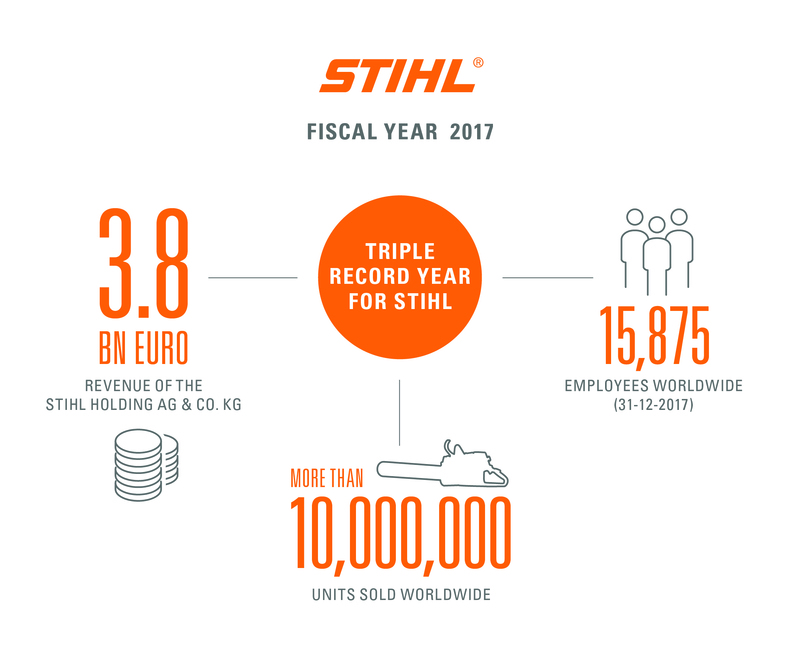 "The STIHL Group achieved a record high once again in 2017 with sales revenue amounting to 3.8 billion euro. 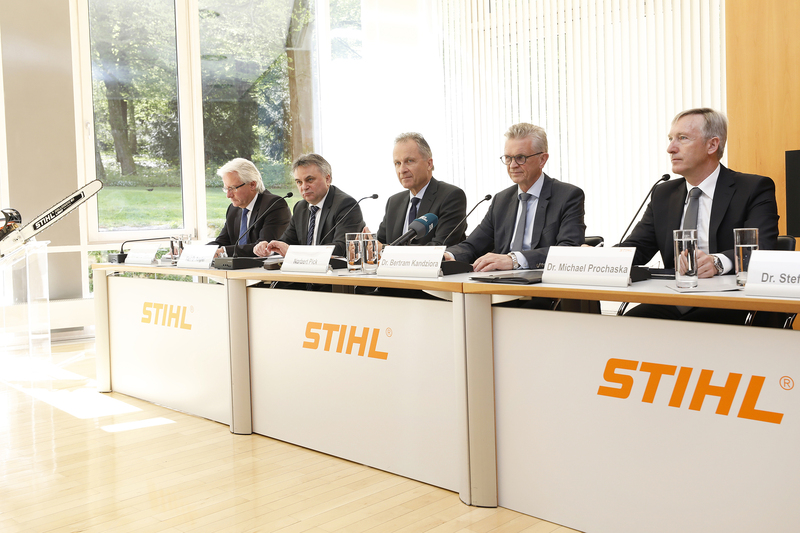 This corresponds with an increase of 9.7 percent compared to last year", announced STIHL executive board chairman, Dr. Bertram Kandziora, during the company's financial press conference on 18th April in Waiblingen. Had foreign exchange rates remained at the previous year´s level, growth would have actually been 10.2 percent. "We have significantly increased our market share and consolidated our leading position in global markets", continued the executive board chairman. In addition to gasoline-powered tools, cordless products for private users were also among the growth drivers. "In order to make our products even more attractive, many of our activities in 2017 were characterized by digitalization. We want to create real added value for end users and our dealers by harnessing new technologies and intelligent networking." The STIHL Group recorded growth rates in the two-figure range on all continents in 2017. "Last year we sold more than 10 million motor units worldwide for the first time", emphasized Dr. Kandziora. Unit sales in the gasoline-powered segment achieved double-digit growth, for cordless battery products it more than doubled. "We were able to acquire new customer groups with the expanded cordless product line. The newly introduced cordless products for private users are also popular and have triggered a strong surge in demand worldwide", noted the chairman. North America and Western Europe were once again among the strongest markets. However, above average growth was also generated in Asia and Oceania. The positive development worldwide is also reflected in the number of employees. "We already exceeded the 15,000-mark at the beginning of 2017. On the reporting date 31th December 2017 the STIHL Group employed a workforce of 15,875. This equates to a rise of 6.4 percent compared to last year", continued Dr. Kandziora. In the German market STIHL achieved a significant increase in unit sales and revenue in 2017. "The chainsaw business showed healthy growth. And also the VIKING iMow robotic lawn mower and the new STIHL cordless lawn mower, which were introduced during the course of rebranding, have met with a positive response from our customers", explained the executive board chairman. "In 2018 we will expand our market position with new products, strong campaigns and further investments in the expansion of our network of specialist dealers." At the German founding company, the ANDREAS STIHL AG & Co. KG, revenue increased in comparison with last year by 13.3 percent to a record level of 1.15 billion euro. At 88.9 percent the export quota remains at the previous year's level. The workforce grew by 6.6 percent and now stands at 4,654 employees. On the reporting date 31st December 2017, 3,618 of these were employed in Waiblingen, 278 in Ludwigsburg, 693 in Prüm-Weinsheim and 65 in Wiechs am Randen. Due to the strong business performance 120 employees had already been given permanent employment contracts last year, and further 80 employees received permanent employment contracts by the end of March 2018. "We are expecting a further increase in the number of employees at our company headquarters during the current fiscal year. In the sectors connected products, cordless, electronics and IT over 200 vacant positions are to be filled in the near future," emphasized Dr. Kandziora. The significant growth makes large-scale expansions and construction necessary. In 2017 the investment volume within the STIHL Group amounted to 248 million euro. Of this, some 30 percent flowed into the German founding company. This contrasted with depreciation and amortization amounting to 156 million euro. "With an equity ratio of 70.2 percent our capital and financial structure remains strong. As a profitable and independent family-owned company and thanks to our shareholders' restrained policy of withdrawing funds, we are able to finance all investments from our internal liquid funds", emphasized Dr. Kandziora. The funds are flowing into – among others – the worldwide production and sales network, research and development and the IT infrastructure. The company is planning to invest more than one billion euro worldwide by 2021. 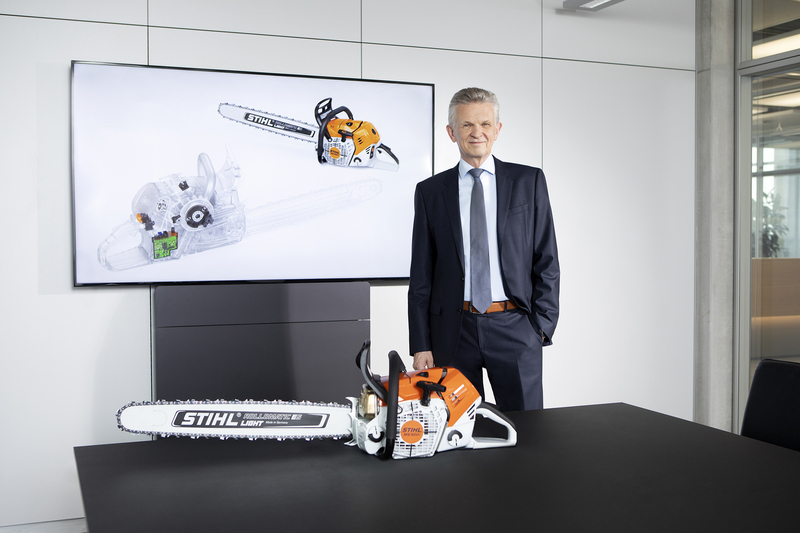 "Digitalization could become the growth engine for STIHL in the years ahead. We have already been working on digitalization for several years – but in 2017 really got going", emphasized the chairman of the STIHL executive board. "The development and manufacture of robust and reliable products in the usual top STIHL premium quality remains the focus of our activities. We are making these even more attractive with software and smart services", stressed the STIHL executive board chairman. The potential applies to the entire value chain, beginning with production processes and extending through smart products and new business models right up to service and sales. "We can see promising opportunities, particularly in the business fields Smart Garden, Forestry 4.0 and Advanced Landscaping. But there is also huge potential in the areas of fleet management, theft protection and optimization of maintenance intervals", said Dr. Kandziora. In order to be able to bundle and accelerate all activities relating to digitalization, STIHL has established new structures and operational procedures. Last year the new Digitalization Department and the STIHL Digital GmbH were established. This company invests in young enterprises which develop digital business models and bring them to product maturity. Dr. Kandziora: "Furthermore, we are consequantly developing our processes in order to allow us to operate even faster and more dynamically. For example, we have established first "Innovation Labs" within the company, in which interdisciplinary teams are working intensively on new business ideas". With the STIHL GCI 100 Smart Garden Hub the company presented an intelligent solution, "which not only makes irrigating your own garden more efficient while saving on costs and resources, but also hints at the beginning of a vision of the smart garden of the future", explained Dr. Kandziora. The STIHL GCI 100 controls the irrigation of domestic gardens and larger areas, such as parks and sports pitches, on the basis of up-to-date weather data. The intelligent system is operated via an app which runs on a smartphone or tablet PC. "This simplifies garden maintenance and reduces water consumption in the garden by up to 50 percent", emphasized the chairman of the STIHL executive board. Furthermore, the product can be networked with the VIKING iMow robotic lawn mower, thereby allowing mowing and irrigation intervals to be coordinated with each other. With STIHL connected the company is opening up new possibilities for private customers in terms of the maintenance and care of their tools. The system consists of the STIHL Smart Connector, which is attached on the machine and records and stores its operating hours, and a STIHL app to which the machine data is transmitted via Bluetooth. This gives users a detailed overview of the operating times of their tools, allows them to view maintenance recommendations and to make a service appointment with their dealer directly via the STIHL app. Furthermore, the tool data can be transmitted to the service center in advance, allowing workshop times to be reduced to a minimum. "To meet the special requirements of professional users we are currently developing a system that allows efficient fleet management on a digital basis and offers benefits for customers and approved dealers alike", announced Dr. Kandziora. 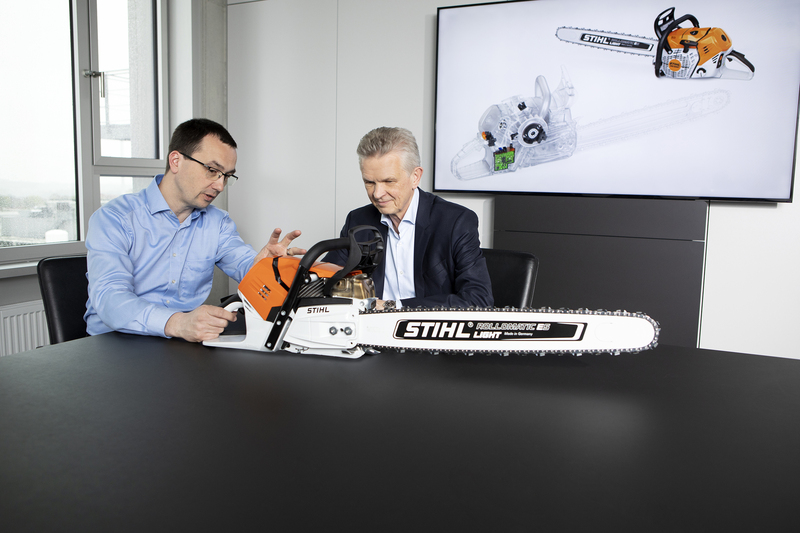 The first gasoline-powered chainsaw with electronically controlled fuel injection, the STIHL MS 500i, will be available worldwide at the beginning of next year. 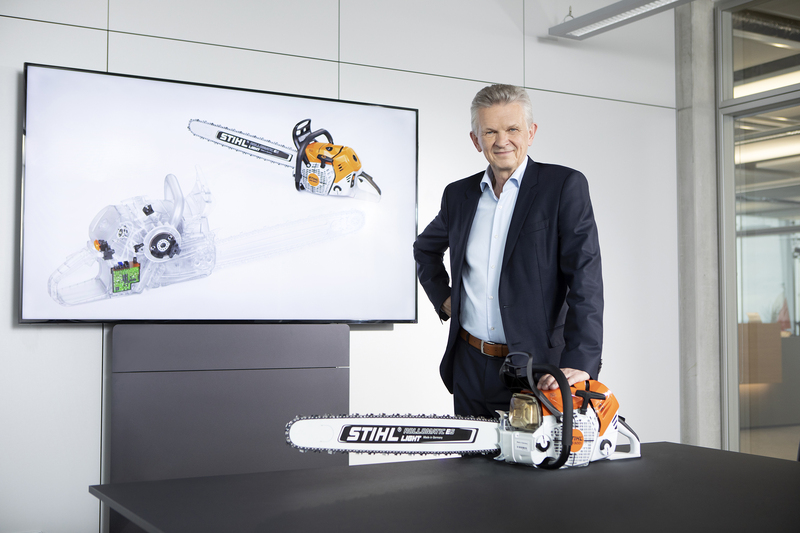 "Due to the high level of interest, the STIHL MS 500i is already available for the 2018/19 season in selected markets – including Germany – in limited quantities", announced the chairman of the STIHL executive board. He clarified: "The STIHL MS 500i opens up a completely new field of technology for gasoline-powered chainsaws and underpins the technological leadership of STIHL", stressed Dr. Kandziora. Thanks to its lightweight construction it is characterized by its low power-to-weight ratio of less than 1.24 kg/kW, a figure that has never before been achieved. The unit also sets new standards when it comes to ease of operation and servicing. The motor does not require a carburetor, because the fuel is metered via an electronically regulated injection system. "Moreover, the chainsaw exhibits impressive dynamics. The chain accelerates from 0 to 100 km/h in a fraction of a second", said Dr. Kandziora. Trade visitors will have the first opportunity to test the STIHL MS 500i themselves at the Interforst Exhibition in July. All of the new STIHL products that were presented at the fall press conference last year have either already been introduced or will be launched, as planned, on the market in the near future. The new products that are already available include the STIHL TS 440, which is the world's first cut-off machine with Quickstop wheel brake, the wet and dry vacuum STIHL SE 133 ME and the cordless mulching mowers and cordless lawn mowers which are now available in typical STIHL orange following the rebranding. These include the STIHL RMA 235, STIHL RMA 339 C, STIHL RMA 443 C and STIHL RMA 448 TC lawn mowers together with the STIHL RMA 2 RT mulching mower. Ready for imminent market launch are the STIHL MS 462 C-M R emergency services saw, which is designed to meet the special requirements of fire department and disaster control services, and the STIHL KMA 130 R cordless KombiEngine from the PRO Cordless Power System, which can be fitted with around a dozen different KombiTools, therefore making it an all-rounder for lawn care applications. The VIKING product line is being expanded with the VIKING MI 422 PC robotic mower, which can be controlled via an app from anywhere – from the own terrace as well as from the vacation. "This increases convenience and flexibility for our customers. Moreover, by integrating weather data, the actual weather conditions can be taken into consideration when planning mowing schedules", explained Dr. Kandziora. Further new products from VIKING include the VIKING MB 448 PC gasoline mower with rear-wheel-drive and the maneuverable VIKING LE 240 electric scarifier. The Stihl TIMBERSPORTS® Series, the premium class in lumberjack sports, is bringing an international trophy competition to France for the first time with the Champions Trophy: on 26th May 2018 the world's twelve best lumberjack sportsmen will be competing man versus man at the old port of Marseille. In another premiere, the international season finale of the Stihl TIMBERSPORTS® Series World Championships will visit the British city of Liverpool. At the start of the competition the best national teams will participate in the relay race at the Echo Arena on 19th October 2018. On 20th October twelve athletes will take part in the individual competition, aiming to win the most coveted title in lumberjack sports. In both cases the objective, among others, is to get ahead of the defending champions New Zealand, who clearly dominated the World Championships in 2017. 2017 was a triple record year for STIHL. Revenue, number of employees and number of sold motor units were at an all-time high. STIHL Chairman of the Executive Board Dr. Bertram Kandziora presents the STIHL MS 500i, the worldwide first gasoline-powered chainsaw with electronically controlled fuel injection. With this innovation, STIHL underpins the technological leadership. Arno Kinnen (left), leading project manager development MS STIHL 500i, in a talk with STIHL Executive Board Chairman Dr. Bertram Kandziora. The STIHL MS 500i is the worldwide first gasoline-powered chainsaw with electronically controlled fuel injection. 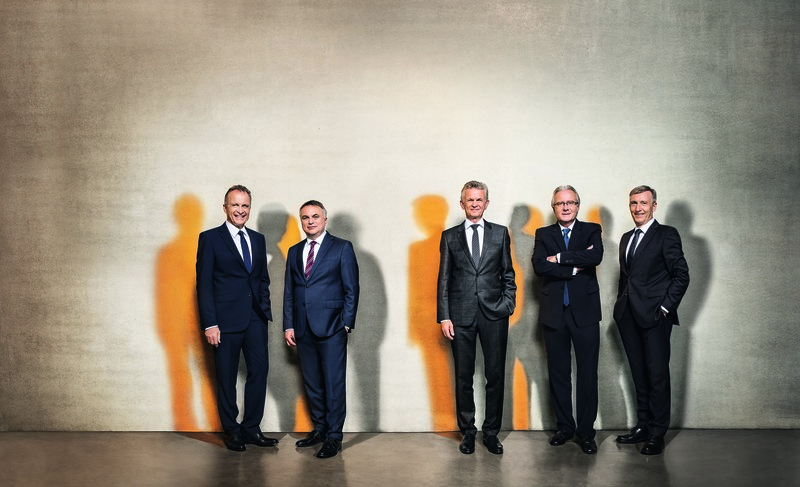 STIHL Executive Board: Norbert Pick (Marketing, Sales), Karl Angler (Finance, Information Systems, Service), Dr. Bertram Kandziora (Manufacturing, Materials, Chairman), Wolfgang Zahn (Development), Dr. Michael Prochaska (Human Resources, Legal Affairs). STIHL financial press conference 2018 the Executive Board from left to right: Wolfgang Zahn, Karl Angler, Norbert Pick, Dr. Bertram Kandziora (Chairman of the Executive Board) and Dr. Michael Prochaska.